My annual round up of the best new indie Christmas songs: what a glorious and unusual lot. Featuring the likes of Smoke Fairies, Hand of Glory, Hannah Peel and many others. I’ve been too busy to do any recommended Christmas present blogs this year but I couldn’t forgo my annual Christmas music round up. Here’s what I recommend listening to for the 2014 festive period. The Smoke Fairies release Wild Winter – an antidote to the usual jingly affair that encapsulates the sometimes sorrowful aspects of Christmas. Scuzzy guitars, off kilter chords and ponderous drums ground the sweet vocals on a subtlely betwitching album that could easily be enjoyed throughout the year. 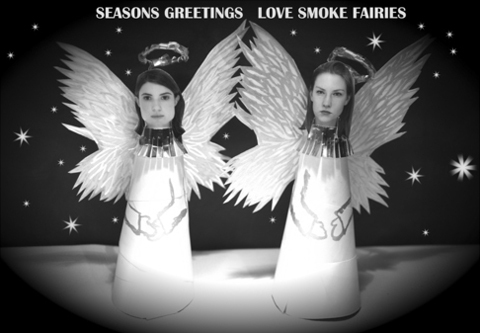 The Smoke Fairies say ‘Sometimes winter provides us with a sense of togetherness and love and sometimes it leaves us feeling alienated, cold and playing a glockenspiel alone in a darkened room. It’s part of the year that will always be bittersweet and wild.’ The video for the jaunty Three Kings features a succulent, an embroidered star and toilet roll kings: what’s not to like? The Singer and The Songwriter is Rachel Garcia and Thu Tran: combining multicultural influences with lush jazz inflected vocals in the softly beautiful Those Old Christmas Songs. Another Messy Christmas by Dan Michaelson adopts an unusual viewpoint – that of Mrs Christmas, ever tolerant as Santa spends yet another festive season at work. The brilliant A Yodelling Christmas Song by Lynne Butler came out in 2013, but I heard it for the first time on 6 Music this year, and instantly fell in love. Just check out the totally lo-fi video with the little boy jingling away in the back ground. In a curious case of synchronicity Ontario based singer songwriter Carly Thomas releases Hold You (On Christmas Eve) – another song that takes a light-hearted look at the longest night of Santa’s year through the eyes of Mrs. Claus, left home alone. Hannah Peel releases the synth-tastic Find Peace as part of the Snowflake Christmas Singles Club, a small Netherlands-based festive label set up for the love of making limited vinyl just for Christmas. The song is a haunting offering with a distinctly contemporary feel. Bethany Weimers presents Winter Heart: it’s not entirely Christmas focused but I love the animated video that accompanies this lilting tune. Song Four | Black Christmas by High Contrast from Occupation on Vimeo. Lastly, High Contrast’s new Christmas-themed protest song, Black Christmas is worth a mention as I am sympathetic to the theme of over consumption, and the video is great. Ah, and here’s a late addition from Dublin based Monster Monster: with Christmas in Liverpool.